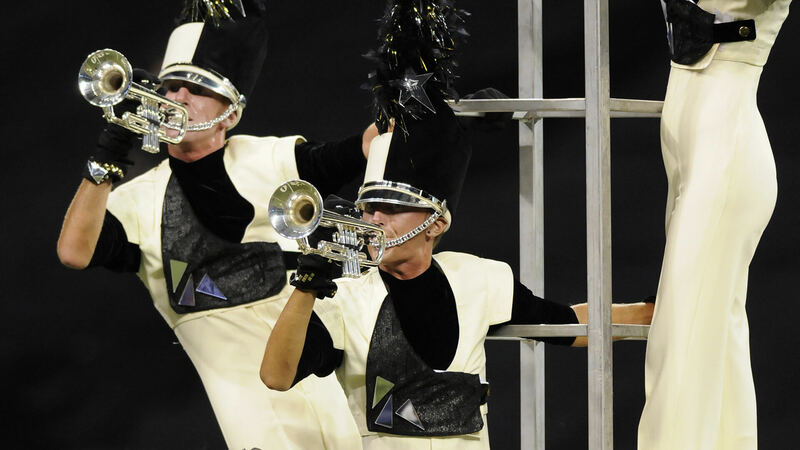 At the first 2011 Drum Corps International Tour event in mid-June, Carolina Crown bested the top-eight corps from the year before. But starting with the next show, the Cavaliers went on a 22-show win streak, prior to placing third in seven of the final nine shows of the season. By the end of the summer, the Cavaliers sat in third and Crown in fourth, just a quarter of a point above Phantom Regiment. The Cadets, who took fourth place at that first show in Texas, ended the season by taking the DCI title, their 10th, with their “Between Angels and Demons” production. 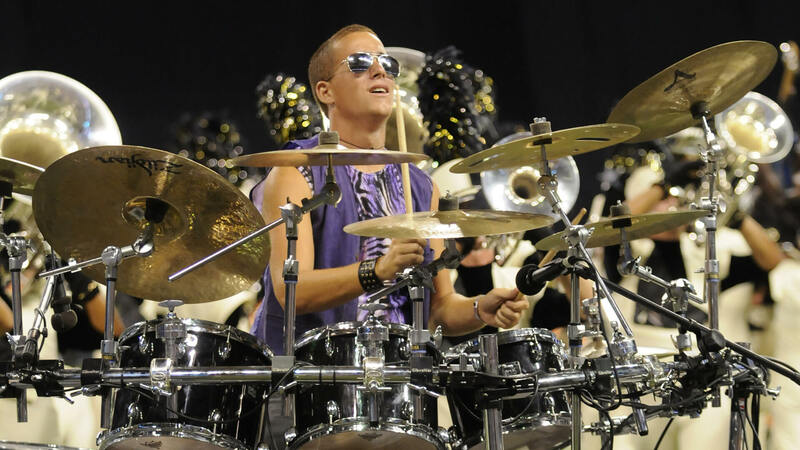 Carolina Crown picked up groupies all season long in 2011 with the corps’ show, “Rach Star,” combining the music of Sergei Rachmaninoff with some of the rock giants of the prior four decades. Rachmaninoff was a famed Russian pianist and composer whose life spanned 70 years up until 1943. Many consider him the last of the great Romantic composers. Long before such statistics became political fodder, he was known for his remarkably long hands, allowing him great flexibility on the piano. Some believe the spectacular span of his hands was due to suffering from acromegaly, a condition where the pituitary gland produces excessive growth hormones. The corps got into the spirit of a “Rach Show” right from the start while warming the crowd up with a drum feature based on Queen’s “We Will Rock You.” Brian May, the band’s lead guitarist, wrote the ditty for Queen’s 1977 “News of the World” album. Mostly based on foot stomping and clapping, the piece instantly drew drum corps audiences in. One performer body surfed over several corps members as if in a mosh pit and was then delivered to his piano, allowing him to kick off the judged portion of the show. Setting the stage, Crown’s makeshift concert venue on the football field included seven tall speaker-and-light tower props suggestive of those seen at large rock concerts. The corps came out of the star form with the Allegro vivace movement of Rachmaninoff’s “Symphonic Dances,” from the 1940 orchestral suite that was the composer’s final composition. Rachmaninoff based the final few minutes of the piece on a resurrection theme that developed into a victorious acclamation, as evidenced by the fact he wrote, “Hallelujah” at that part in his score. During a short chorale version of the Rolling Stones’ “Paint it Black,” the horn line formed a giant horned hands sign in the drill, commonly flashed by rock concertgoers. The lead rock star of the show, the guard’s noted soloist Herbert, executed a huge rifle toss that led right into the rest of the Stones’ classic. Forming a giant electric guitar, with the color guard as the neck and the drums as the strap, the horns next played a classical rendition of the famous Eddie Van Halen guitar solo from “Eruption,” first performed in 1976 and considered one of the greatest rock guitar solos ever. The brass players then went into a replication of a strumming air guitar tribute, with the drum major swinging his arm in complete circles as if vigorously shredding said guitar. In a complete change of pace, the horns next played the five-part a cappella chorale introduction to “Bohemian Rhapsody” as the color guard members, in the upper left corner, turned into paparazzi taking flash photos of the rock star, Herbert. Corps members brought down the towers on the field and color guard soloist Herbert attempted to smash a guitar, which during the Finals competition refused to cooperate. With guitar overdrive feedback coming over the speakers, he threw the instrument as the rest of the corps members pointed to the audience and gave sign of the horns with their hands. Rachmaninoff was now the hippest composer around. For this week only, you can save on the DVD or Blu-ray set that contains this Carolina Crown performance, along with all of the finalist corps at the 2011 DCI World Championship. Buy the 2011 DCI World Championship Blu-ray set. Buy the 2011 DCI World Championship DVD set. Discount offer ends Monday, May 2, 2016.